James Foldys Hitchon was born to George Henry Hitchon and Margaret Hitchon at Burnley on 4th July 1894. The 1901 Census shows the family to be living at Pendlehurst in Habergham Eaves, Burnley. James' father was a land surveyor and valuer at the time, and the family could afford to employ a domestic servant as well as a nurse to help look after James and his sisters Susannah Margaret (born 1895) and Eleanor Mary (born 1898). A younger brother, Lawrence Foldys, was born in 1905. The family was still living at Pendlehurst when James entered the Preparatory School at Sedbergh in 1904, but had moved to Ashlar House in Fence, Burnley before James graduated to Sedbergh School in September 1908. 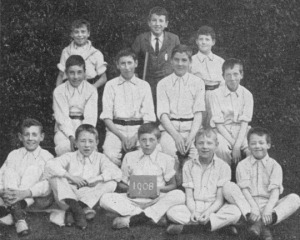 Left: 1908 Cricket XI, Preparatory School, Sedbergh. Photograph by kind courtesy of Mr. R. Gladstone, Miss M. Gladstone and Sedbergh School. J.F. Hitchon come to us in May, 1904. He was a boy of a quiet and amiable disposition and got on well with everyone; though not brilliant at work or play he was absolutely straight and trustworthy. He was good at music, and with his fidus Achates, H.C. Davies, he performed excellently in 'The King and Lazilee' in 1907. He got into our Football XI in 1907, and in 1908 his team won the Yard Sixes. He was in our Cricket XI in the same year when again he and his friend distinguished themselves in 'The Quest of the Golden Boy'. James remained at Sedbergh only until July 1910 when he left to train as an architect. While at the school, he served for two years in the Officer Training Corps. 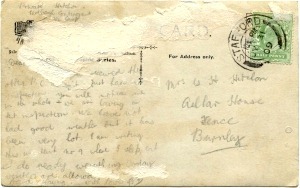 A postcard sent by James to his mother on 31st July 1909 while in O.T.C. Camp at Stafford has been kept by his family. Above: Postcard sent by James to his mother on 31st July 1909. By kind courtesy of Howard Richard Hitchon. Click to enlarge Above: Reverse of postcard - Sedbergh School O.T.C. 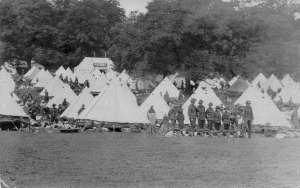 at Camp, Wolsley Bridge, Stafford in 1909. By kind courtesy of Howard Richard Hitchon. By 1914, the Hitchon family had moved from Fence to Hoghton Bank in Hoghton. On 4th September 1914 - one month to the day after war had been declared against Germany - James enlisted at Preston into the ranks of the The Loyal North Lancashire Regiment. He was described as being 5ft 6½in tall with good vision and good physical development. 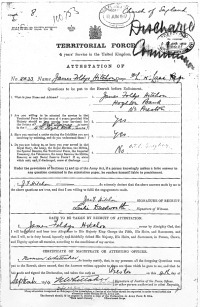 After serving little more than two months as a Private (No.2233) in the regiment's 4th Battalion, James applied for an infantry commission. With the strong support of his battalion's commanding officer, Lt.-Col. Henry Beckwith, James was duly granted his commission and on 20th January 1915 was appointed to the 10th (Reserve) Battalion, East Lancashire Regiment with the rank of 2nd Lieutenant. 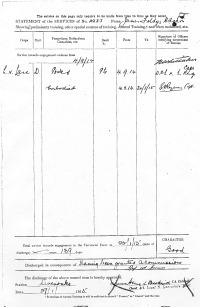 Click to enlarge page 1 Above: Attestation Papers. 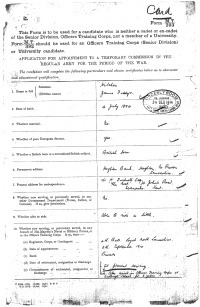 Click to enlarge page 2 Above: Application for Appointment to a Temporary Commission. James served with the 10th East Lancs at Teignmouth, Swanage and Wareham, receiving his promotion to full Lieutenant on 27th October 1915. 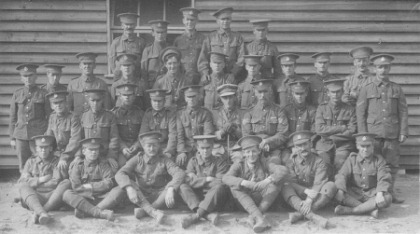 Above: "Jimmy's Platoon, Wareham 1916". Photographs by kind courtesy of Howard Richard Hitchon. Going in trenches, relieved Sheffields 4.0PM, our coy. & Z Coy goes in first line for two days. Weather Medium, first line in awful state after our friends had finished shelling it the same day as we went in! The bay as myself was in the time before was demolished, went rounds with Officer at stand to, finished at Stand down next day! Just a bit of a row now & again. Rest while 12.0 (noon) after stand down. Went rounds with Officer again while 4.30PM, few shells flying. Went Rounds again, stand to. Sergt. Duckworth of our Plattoon killed with shell. Sergt. Heaton of same Plattoon wounded in hand with same shell, finished after stand down till stand to next day. Got Relieved with X Coy. Went in third line (The Trosacs). Weather splendid! Good view of German line from same trench, went rounds again, rest in afternoon till midnight while rations had been taken to Coy. Weather fine, easy day, nothing doing on our trench, but rough at times on first & second. Went Rounds again till rations had been taken to Companys, stand to & stand down as usual. Plenty Gun fire all day, ours having the best of it. Looking at enemy's lines all day with glasses, but could not see any of our friends. Got relieved at midnight (very rough shower in afternoon) which made it dribble down all night, very dark coming out & raining. For the attack on Serre of 1st July 1916, James led one of eight platoons from Y and Z Companies that formed the 3rd and 4th waves of the battalion's attack. At 7.29am the two waves left their assembly trenches and advanced into the storm of battle, crossing the British front line around 6 minutes later. Watching them from his post at the bomb dump was Z Company's Fred Sayer. Shortly after crossing into No Man's Land, James was hit. Two eye-witnesses were later found while they were recovering from wounds in hospital. Pte. James Scot Dalgleish - possibly James' orderly - had seen him fall into a shell-hole after being shot in the abdomen. Pte. 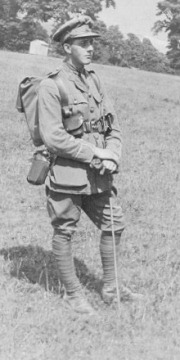 Felix Rawcliff said that he had been with James' orderly in No Man's Land, and confirmed that James had been wounded; under heavy enemy fire, the two men were unable to bring James back into the British lines. At James' home in Hoghton Bank, the family was informed by the War Office only that he was missing. His aunt, Mary Hargreaves, wrote to the War Office to ask for news of him; her letter remains filed with his service papers to this day. In September 1917, "Wasp", the magazine of Evans House at Sedbergh School, published the following tribute. There seems little hope now that Hitchon survived the great attack of July 1st, 1916, though his parents have not received official news of his death. He was a most popular boy in the House, coming here with other friends from Mr. Thomas'. He played for the second House team in both cricket and football, and would have done bigger things still if he had not left rather early. Our sympathy goes to all his relations in their long-drawn anxiety as to his fate. He joined up when the war began, and at the time of his death was a subaltern in the East Lancashires. James' body was recovered from the battlefield many months after the Battle of the Somme had ended. 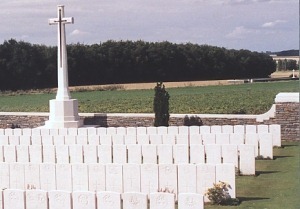 His remains lie buried in the tranquility of Queens Cemetery, close to the spot where he fell on 1st July 1916. James Foldys Hitchon is also commemorated on the Brindle War Memorial in St. James' Church, Brindle and on the memorial at Holy Trinity Church, Hoghton. My thanks go to Steve Williams of the Brindle Historical Society who researched much of this article, and to Howard Richard Hitchon, Mr. R. Gladstone, Miss. M. Gladstone and Elspeth Griffiths (Archivist and School Librarian, Sedbergh School) for kindly allowing me to publish photographs and other material from their collections. Other source material included the 1901 Census and TNA document WO339/34554.